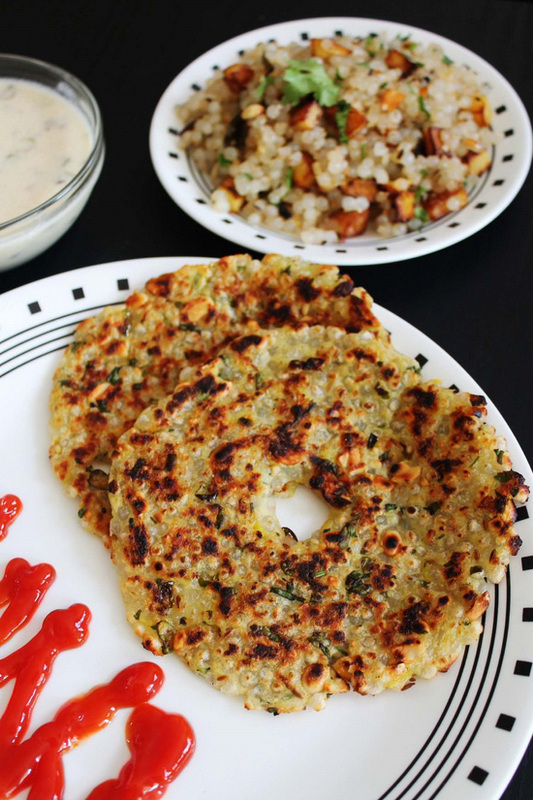 Sabudana thalipeeth recipe – a popular Maharashtrian snack recipe made during vrat, upwas or fasting. 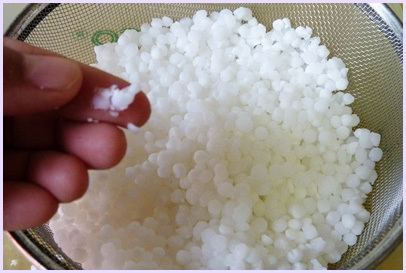 It is made from tapioca pearls. They are soaked and drained well. Then boiled mashed potato is added. Also crushed peanuts and few spices are added. Then rolled into a circle and shallow fried on tawa. It is that simple to make. Sabudana is widely consumed during the fasting days. My family loves any kinds of dish made from sabudana. So I do make many different dishes as mentioned above. Ingredients needed in making thalipeeth are same as sabudana vadas. But texture and taste is totally different. If making this on vrat, serve with aloo ki sabzi or farali kadhi. It will make the filling meal. 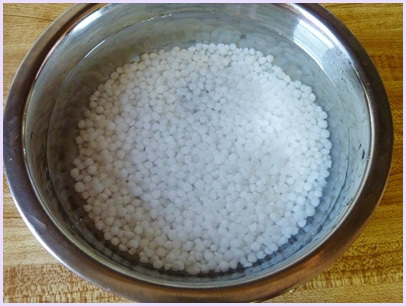 1) Wash sabudana under running cold water till water runs clear. 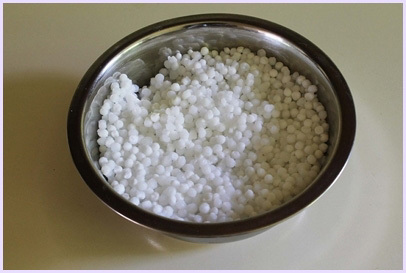 Soak the sabudana in enough water for 2-3 hours or overnight according to your sabudana type. there are so many different varieties of sabudana available in market. Some requires 2-3 hours soaking and some require 8 hours of soaking. So experiment with your sabudana and decide soaking time. Mine needed 5 hours soaking. TIP: Always use shallow bowl to soak sabudana. Never use deep bowl. Add enough water up to just 1 ½ inches above the sabudana. 2) After it get soaked, sabudana will swells up almost all the water and they will becomes almost triple in size. 3) Drain any excess water from it using strainer. Let it drain at least 10 minutes. This is very important step to avoid stickiness of sabudana. 4) Let’s check sabudana if it is soaked properly or not. When you press one soaked pearl between your finger and thumb, it should mash very easily without any effort. 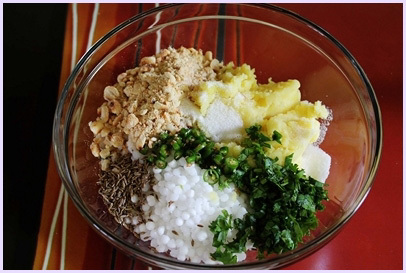 5) Take all drained sabudana, mashed potato, crushed peanuts, green chili, coriander leaves, cumin seeds, salt, sugar and lemon juice in a bowl. 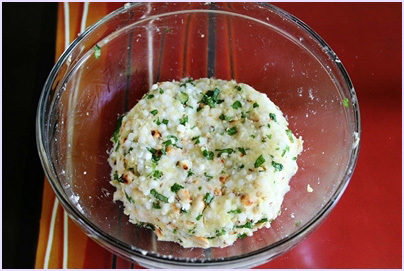 6) Mix them well and make dough like ball. If it is too soft then you can add any fasting flour (rajgira flour or Shingara flour or sama flour). 7) Divide it into 4 equal parts. And make a smooth ball using your palms. 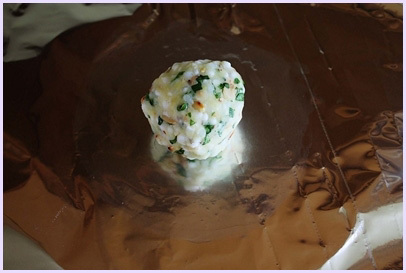 Take a piece of aluminum foil or plastic, grease it with oil and put that ball on top of it. And also heat the pan on medium heat for pan frying the thalipeeth. 8) While pan is heating, make 4 inch diameter thalipeeth by pressing the ball with your hand. Keep sealing the edges as you press if it breaks. And also make about quarter inch hole in the center with the help of your finger. 9) Once pan is hot, drizzle some oil in the pan. 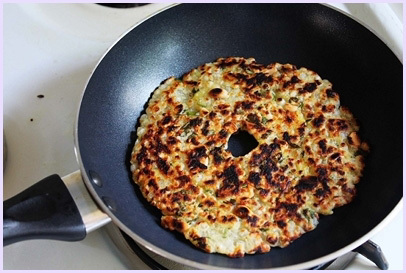 Carefully take thalipeeth in your hand with the help of foil and put it in the pan. 10) Let it brown on bottom side, drizzle some more oil on top of the thalipeeth and then flip it. Also cook on other side till it becomes golden brown. Remove it from the pan and repeat the same process to make remaining thalipeeth. Serving suggestions: If making this on vrat, serve sabudana thalipeeth with farali kadhi or dahi aloo or farali chutney. Here I have served with ketchup because I made this on regular day. Ketchup is not considered as a fasting food. 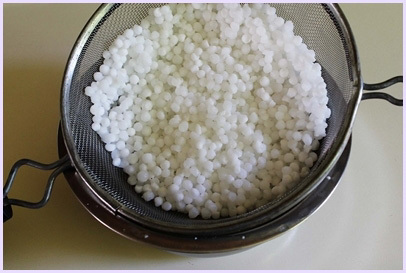 Soak the sabudana in enough water for 2-3 hours or overnight according to your sabudana type. there are so many different varieties of sabudana available in market. Some requires 2-3 hours soaking and some require 8 hours of soaking. So experiment with your sabudana and decide soaking time. Add juts enough water up to just 1 ½ inches above the sabudana. 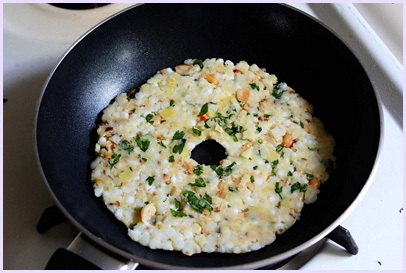 Take all drained sabudana, mashed potato, crushed peanuts, green chili, coriander leaves, cumin seeds, salt, sugar and lemon juice in a bowl. Mix them well and make dough like ball. If it is too soft then you can add any fasting flour (rajgira flour or Shingara flour or sama flour). Divide it into 4 equal parts. And make a smooth ball using your palms. Take a piece of aluminum foil or plastic, grease it with oil and put that ball on top of it. And also heat the pan on medium heat for pan frying the thalipeeth. While pan is heating, make 4 inch diameter thalipeeth by pressing the ball with your hand. Keep sealing the edges as you press if it breaks. And also make about quarter inch hole in the center with the help of your finger. Once pan is hot, drizzle some oil in the pan. 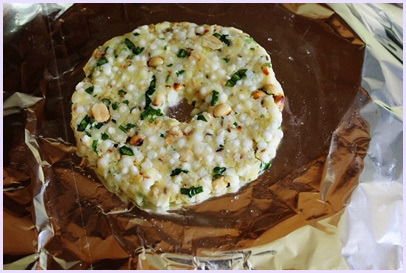 Carefully take thalipeeth in your hand with the help of foil and put it in the pan. Let it brown on bottom side, drizzle some more oil on top of the thalipeeth and then flip it. Also cook on other side till it becomes golden brown. 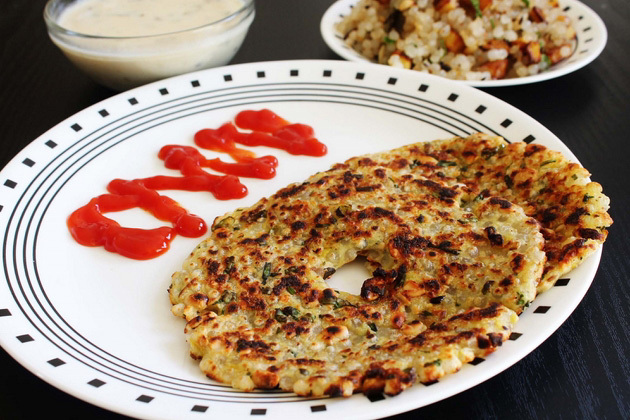 Hi kanan, Tried this recipe today for an interesting breakfast and turned out really well. Nice healthy start for the day. I sprinkled some pomegrante pearls on top of it, just to add a little dash of anti-oxidants to the first emal of the day 🙂 Lovely and easy recipe and your simple instructions with pictures are most helpful. Love trying your recipes. Thank you and God bless. 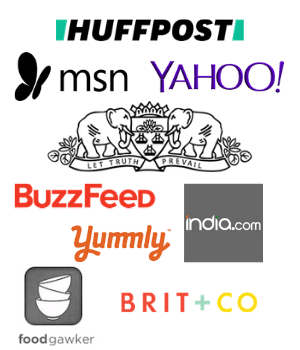 Thank you pooja for detailed feedback.